1. The product is a modern and stylish design. 2. Simple style metallic kitchen pot rack, specially designed for storing pots and utensils. 3. Can help to save even more space in your kitchen. 4. With 10 S-type hooks. 5. The pot rack is made of durable materials welding. 6. It has been specially treated to prevent rusting. 7. There are two installation methods for the pot rack, either method allows you to organize the containers and utensils in the way you want. 8. 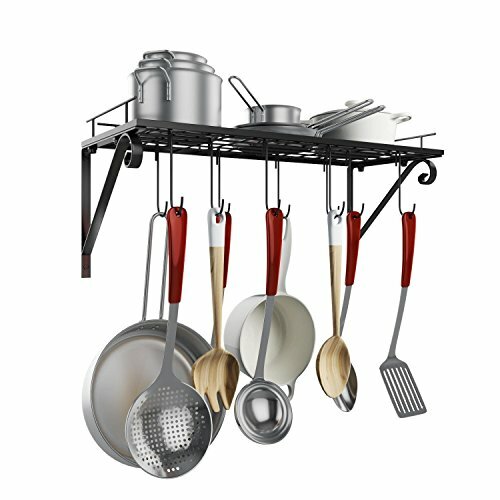 This pot rack can be installed on your balcony, study or bathroom and can be used to hang many other types of household items. 9. You can to stow pots, pans and other kitchen utensils and to arrange them neatly. 10. Easy to use and install. Rack size: 24.5 x 9.9 x 10inch. It is compact and space-saving with 10 S-type hooks. It is durable enough to hang a lot of pans and cookware. It can withstand 30-40 lb weight. It is specially treated to prevent rust. If you have any questions about this product by Leoneva, contact us by completing and submitting the form below. If you are looking for a specif part number, please include it with your message. Old Dutch Dome Pot Rack with 16 Hooks, Oiled Bronze, 20" x 15.25" x 21"